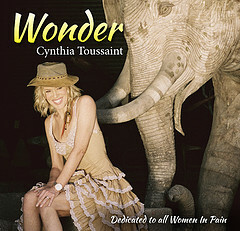 Our spokesperson, Cynthia Toussaint, has recorded her first CD after losing her singing voice to CRPS for 15 years – and this testament to the healing power of music therapy is dedicated it to all Women In Pain. Dubbed “The Wonder Project”, this collection of songs captures the essence of the pain experience while conveying the joy of reinvention and coming out the other side to better wellness. You’ll receive your CD in the mail in 2-4 weeks. Thank you! The Wonder Project was made possible by a generous donation from The Phyllis Gebauer Family Trust.